As part of its Sustainable Water Resource Development & Management (SWRDM) program, PepsiCo India, along with its partner Alternative Development Initiatives (ADI) – a Development Support Organisation, today handed over a partnership project on ‘Water Replenishment ‘ to four Panchayats (Panwan, Masani, Phumanwal and Bhaktari) in Bhawanigarh Block of Sangrur district, Punjab. The SWRDM program has recharge potential of 100 million liters and is expected to benefit a total agricultural area of more than 350 acres, positively impacting 150 farmers and over 5,000 villagers in the long term. 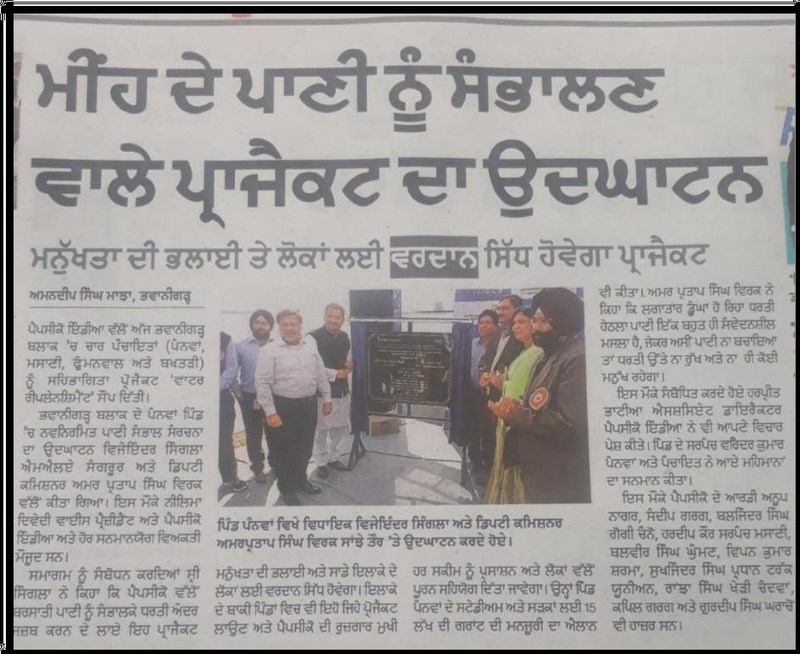 The newly constructed water harvesting structure in Panwan village in Bhawanigarh Block was inaugurated by Shri Mr. Vijay Inder Singla- MLA, Sangrur, and APS Virk, Deputy Commissioner, Sangrur in the presence of other dignitaries including Smt. Neelima Dwivedi-Vice President Corporate Affairs, PepsiCo India. The PepsiCo SWRDM program in the Bhawanigarh Block includes water replenishment through the creation of a newly created rainwater harvesting pond in Panwan besides three rejuvenated rainwater harvesting ponds in Masani, Phumanwal, and Bhaktari. Speaking on the occasion Mr. Harpreet Bhatia, Associate Director-Manufacturing, PepsiCo India, said, “As a part of its Performance with Purpose goal, PepsiCo is committed to working with local communities it directly operates in, to improve livelihoods and incomes in a sustainable manner. ADI is a group of professionals working for water resource management and need based sustainable livelihood promotion. The group of professionals are drawn from premier institutes around the world had made seminal contribution in the development sector virtually in every State of Republic of India and various other places globally. All Rights Reserved. Designed & Developed by Seoily.